Despite the strange name, the color is beautiful. And guess what!? It's very opaque, like opaque in one coat. That is not typical with Essie polishes, so I was so impressed. Have you grabbed any new Essie's lately? oh you got a nice blue collection! Thank you:) I love blue polish. I still don't get it.... LOL. I just picked this up today! And for some reason, it was on clearance at Ulta, so I only paid $4.00 for it! What??? They must have screwed up. lucky duck! Very pretty! Your pics are always so lovely. I adore that bottle shot. Oh my goodness! This is beautiful. I'm usually really skeptical about blues but I think I could pull this one off! Haha i love this color. I think the names of the collection are based off famous shopping squares across the world, not sure what one this is inspired by but i guess it's in paris ;) also, i think the opi on the far left of your photo is misnamed! You are soooo right! That's Can't Find My Czechbook! I need to change that. I knew it was something that couldn't be found...a Chauffeur...a Czechbook....LOL. Thanks for catching that! Good eye. 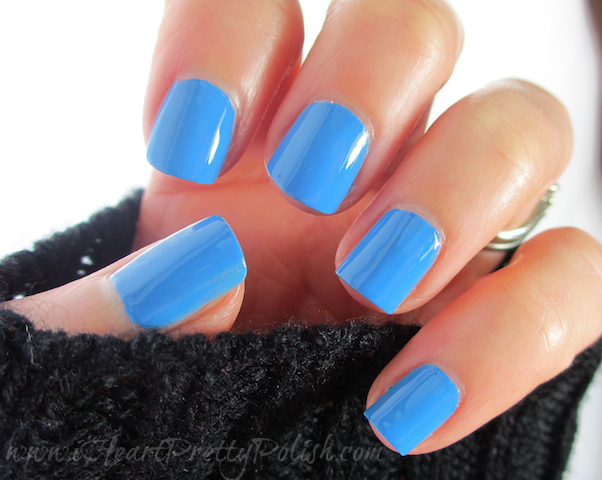 This is a beautiful shade! At first glance, it does look easily dupeable, so I hadn't given it a second glance. You make it look gorg though! I thought so too, but was pleasantly surprised at how unique it was. The name comes from a beautiful street in Paris called Avenue Montaigne (could be pronounced in English as Avenue Maintain)- lots of fabulous ultra expensive stores that have the most amazing window displays. I was too intimidated to even step foot in them. I was lucky enough to live a few blocks away from this street when I lived in Paris. At Christmas time this street is breathtaking with all the lights in the trees and holiday windows. Breakfast at Tiffany's? Meh. Nothing like nibbling on a warm pan au chocolat while strolling down Avenue Montaigne! Wow, that sounds AWESOME! Thanks for clarifying :) It's so cool to meet people from so many places around the world.